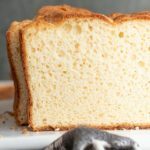 This low carb and keto soul bread recipe is here to show you just how fluffy and delicious low carb bread can be! Preheat oven to 325 F and prepare a 9x5" bread pan with cooking spray. Soften cream cheese and melt butter (this can be done in the microwave using 30 second intervals). Add cream cheese, butter, olive oil, heavy cream and eggs to a large bowl and blend using a stick blender until everything is well combined. In a second bowl mix the protein powder, baking soda, baking powder, xanthan gum salt. Pour batter into greased bread pan and bake for 45 minutes. You'll know the bread is done when a knife inserted in the center comes out clean and the top is golden brown. Recipe says only certain protein powders will work: Isopure Whey Protein Isolate or Hoosier Hill Farm Whey Protein Powder Isolate. I used True Athlete Natural Whey Protein and mine turned out great! Original recipe suggests melting butter on top of the bread to make the dryness of the crust less dry.